Rothko described the conception of a painting in which "shapes"--or "performers"--first emerge as "an unknown adventure in an unknown space." In the journal Possibilities he explained that these "shapes have no direct association with any particular visible experience, but in them, one recognizes the principle and passion of organisms." He later wrote: "...art to me is an anecdote of the spirit, and the only means of making concrete the purpose of its varied quickness and stillness." 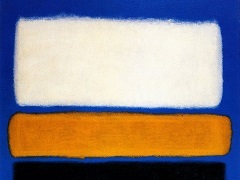 By 1950 Rothko had reduced the number of floating rectangles to two, three, or four and aligned them vertically against a colored ground, arriving at his signature style. 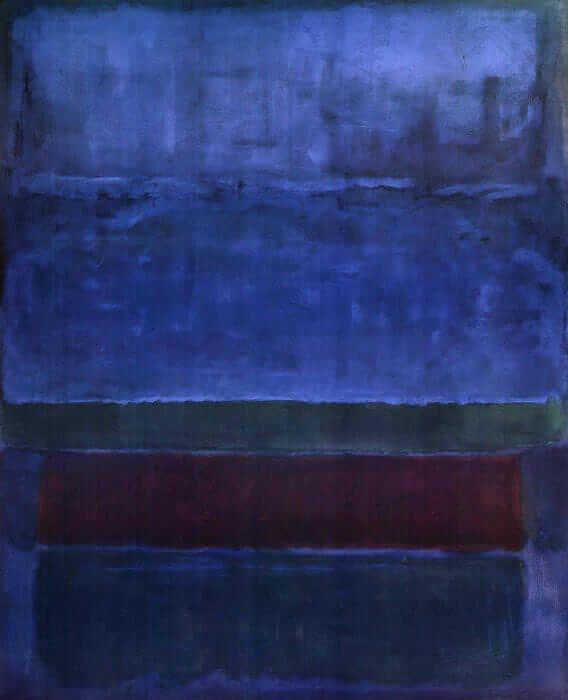 In Blue, Green, and Brown (1952), color and structure are inseparable: the forms themselves consist of color alone, and their translucency establishes a layered depth that complements and vastly enriches the vertical architecture of the composition. Variations in saturation and tone as well as hue evoke an elusive yet almost palpable realm of shallow space. Color, structure, and space combine to create a unique presence. In this respect, Rothko stated that the large scale of these canvases was intended to contain or envelop the viewer--not to be "grandiose," but "intimate and human."